Yay! We’re back with another Meet the Blogger post (some of my favourite to create and post!) and today we’re getting to know Matxi from Matxi Reads Books. Matxi has been a loyal follower of mine for a while now, and I love her blog right back! She reads a mix of genres, which is great for me to find new books, plus her reviews are set up by “general”, “the writing”, “the story” and “the characters”, which I find really useful and breaks down the review perfectly. So, without further ado, let’s get to know Matxi! I am a 28 (soon 29😰) year old, fully committed bookworm from the Basque Country (north of Spain). I combine my love for books with my long-standing relationship with movies and travel-dreaming. I would say those are my main occupations, given that I officially don’t have a job, and I just wish you could earn money from doing that! I read and watch only (well 99%) in English, I’ve some kind of fascination with it. Must confess that although everything points the opposite way, I am a numbers girl, words have never been my thing! Don’t forget to add Matxi on all her social medias! When did you start your book blog, and what inspired you to make it? It wasn’t until early 2016 that I discovered the bookworm world. Everything started with bookstagram and from there I started reading more and kind-of-reviewing the books on Goodreads and last October I decided it was time to push myself (like it says in my bio I am not a words kind of girl and even less writing in a foreign language) and join the blogosphere. What is your favourite book genre to read and why? The first that comes to mind is horror, but I am of the belief that says “never say never” so I’ll probably choose some sub-genre in non-fiction, because the only non-fic that I contemplate on reading are true crimes and biographies/memoirs (if interesting enough). Let’s say some philosophical non-fiction. I don’t even know if that genre exists but if it does, it is a big NO-NO. Starting with the hard ones I see… Confession time, I answered here what I should have answered in question 6 so I’ll correct it by saying that I didn’t like the Legend Trilogy by Marie Lu. Everyone loves it apparently but although I enjoyed the storyline I disliked the continuity and the characters and didn’t care for the writing, which has made me put a hold on ever reading Marie Lu’s works. If you check my reviews, you’ll see I didn’t rate them that low (which I should have), I liked the story and must have been feeling generous, that’s all the reasoning I can give. What was your last 5 star read, and why did you love it so much? I give near 5* ratings quite a lot but not so many full 5*. 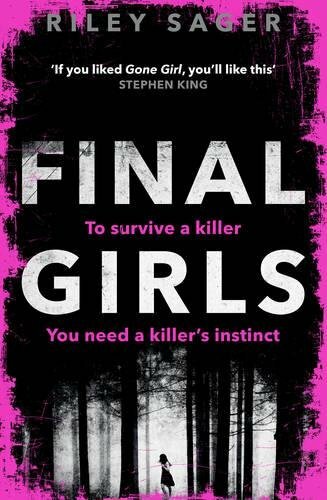 The last 5* I gave (which turns out was my first and only of 2017 yet), was Final Girls by Riley Sager that I got the pleasure to get an arc for and completely loved it! Why did I love it?? As bad as it sounds, it rocked my world and it had so many twists and turns coming at me that it was too much for my poor mind to handle! It comes out in July and I highly recommend it to all of you! From my lasts reads, near the perfect score were The Hate U Give (4.5*), Night Film (4.5*) and The Circle (4.75*). Are there any books out there that you’re completely uninterested in reading? OK, an easy but extensive one: Sarah J. Maas books (you can go ahead and hate me, sorry), The Lunar Chronicles, Rick Riordan’s works, John Green’s, The Maze Runner, The Ender’s Saga, His Dark Materials… that’s to name a few. A lot, I am a bit of a maniac! When talking about content I would say I am completely over that insta-love thing and I am beginning to get very tired of YA characters. Also when you see clearly that the author is playing with you, either not giving enough information or giving too much descriptive information that doesn’t help the story and only confuses you… not cool. Also, I only read paperbacks and I can’t damage spines, so I end up barely opening the books as to not damage them, crazy I know. What is your opinion on secondhand books? I like the idea, although I don’t have any. I wouldn’t buy them to collect them (unless they are in good condition), but I would to read and enjoy them. Name a book you’ve had on your shelves for ages but have neglected reading. Why have you put off reading it? The book that’s been on my physical shelf for the longest has been the first of Marian Keyes, but only because I apparently started reading from her second book and never got to the beginning again (they are standalones, but still). On my goodreads TBR I remember it being The Millennium trilogy by Stieg Larsson (unforgivable). My reasoning for both of them is non-existent. I am going for a dead one, because you can always stalk an alive one 😋, and I know you’ll love this answer Zuky (😂😂). The answer is simple, Jane Austen. For me, her writing is brilliant and I would love her to teach me or to just see her in action. If I could choose another I would go with Charlotte Brontë because I am very interested in the darkness that so appealing was underneath her. So there we have it. That’s Matxi! I hope you’ve all enjoyed reading this post and getting to know all about Matxi, I know I have (even if she loves Jane Austen so much 😂). Don’t forget to visit her blog and follow, along with her other social medias. You MUST read the Millennium Trilogy Matxi! I read it when it first came out, so must be almost 10 years ago and absolutely loved them and I kept thinking I need to go back and re-read them! Yes!! I am actually planning on finally getting my hands on them soon and read them!! YAY!!! I LOVE this series! Thanks so much for introducing us to fab new bloggers!